Regardless of the profession you are in, there are broadly two things that define how productive you are: your knowledge of the subject, and how effectively you carry out your tasks. Talking about efficiency, there are several aspects that contribute to it, with one of them being your ability to perform tasks in a distraction-free environment - anything done with complete concentration is bound to produce better results. If your work involves computers and you are into writing, it's worth knowing that there exist several applications that offer distraction-free writing environment. 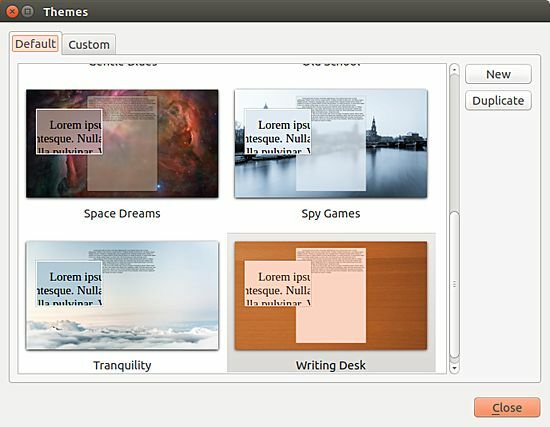 In this article, we will discuss one such application - dubbed FocusWriter - that's available not only for Linux, but for Windows and Mac OS as well. Please note that this article is Linux-specific, with all instructions and commands mentioned here being tested on Ubuntu 16.04 LTS. Further, the FocusWriter version we've used for this tutorial is 1.6.0. 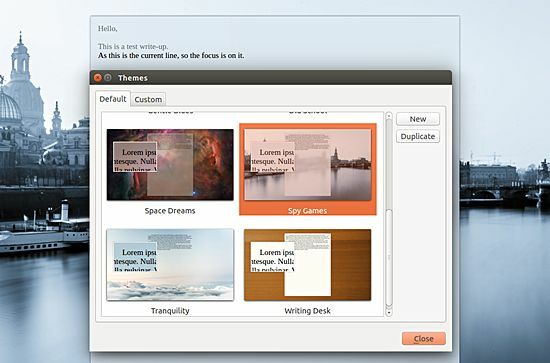 Licensed under GPL3, FocusWriter is a cross-platform app that, as already mentioned, offers a distraction-free writing environment to its users - in layman's terms, you can think of it as a fullscreen word processor. As per the official documentation, FocuWriter utilizes a "hide-away interface," that helps you get quickly immersed in your work. You can, however, easily access the interface with the movement of mouse. So as you can see, the application opens in full-screen mode with a minimalistic UI enough for you to start writing immediately without any distractions - even the mouse pointer disappears after a few seconds. While the File and Edit menu contain familiar options, the Format menu contains options that are typical to a word processor. 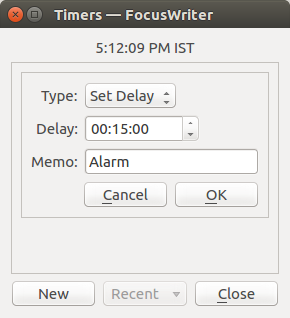 FocusWriter also offers a Timers feature (Tools -> Timers -> New) that lets you set an alarm, presumably so that you can keep track of how much you are writing in a particular time interval. One of the key features of the tool is the ability to set daily goals - you can find the feature as a tab in the Settings -> Preferences window. 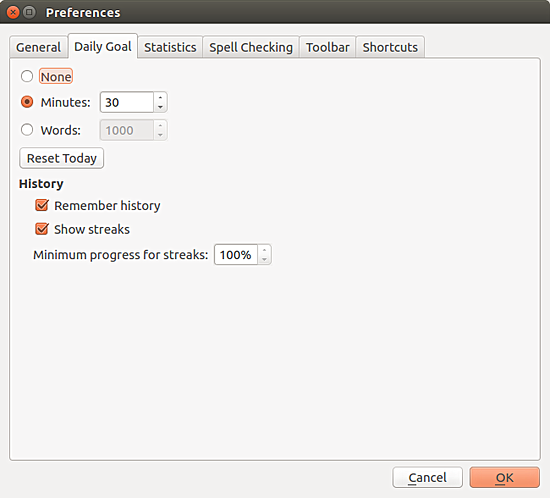 As clear from the screen-shot above, you can set a daily goal based on the number of words you write or the number of minutes you spend on the writing work. 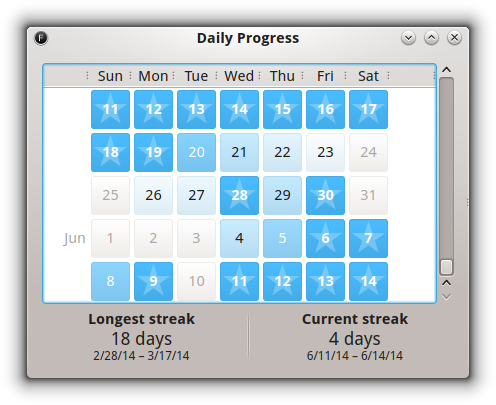 It's worth mentioning that there's also a related feature - dubbed Daily Progress (Tools -> Daily Progress) - that lets you to see how many days in a row you have managed to reach your daily goal. You can not only see the length of the longest streak of days in which you have reached your daily goal, but also get a quick idea of how far through your daily goals were reached, signified by the background color of a particular date. Needless to say, a date box with a star in it represents the day when you successfully reach your goal. Just like moving the mouse pointer to the top displays the available editing and customization options, moving it towards the bottom brings up information like the total number of words you've written so far, percentage of your daily goal achieved until now, and the current time. Moving on, taking the concept of distraction-free environment a step further is a feature called Focused Text (Settings -> Focused Text) that lets you focus on a select piece of text by fading the remaining lines of your write-up. 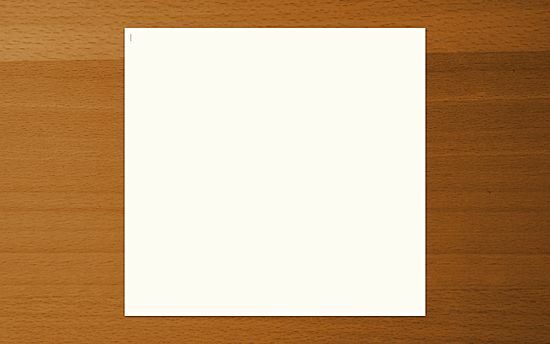 As clear from the image above, you can ask the tool to focus on a single line, three lines, or a paragraph. In my case, I selected the One Line option, and in the following screen-shot, you can see that only the current line is focused in my test write-up. 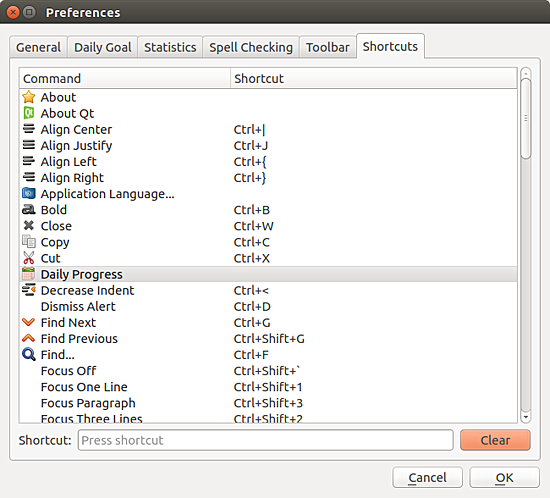 Next up, FocusWriter also provides keyboard shortcuts for most of its features. To take a look at the complete list of shortcuts, head to Settings->Preferences->Shortcuts. Note that shortcuts for some features (for example, Daily Progress) aren't there by default. But you can click on the entry and then define a shortcut by entering a key combination in the Shortcut text box below. Further, the application also offers various UI themes that you can access by heading to Settings->Themes. It is worth mentioning that FocusWriter also maintains an emergency cache which is used for data restoration purposes in case the application isn't shutdown gracefully. While there's no doubt that FocusWriter stays true to its mantra of offering distraction-free writing environment, the real strength of the tool, according to me, lies in the number and usefulness of features it provides - not to mention a large number of customization options that you can find in the preferences (Settings->Preferences) window. 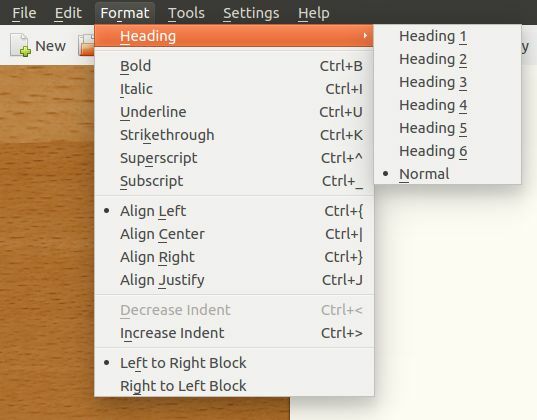 If you're looking for a word process for Linux that not only saves you from distractions, but also offers plethora of productivity-enhancing features, I would strongly encourage you to give FocusWriter a try. I don't see how this tool is more productive than LO Writer of MS Word. Please explain. Good that there is a distraction free mode in QOwnNotes too. 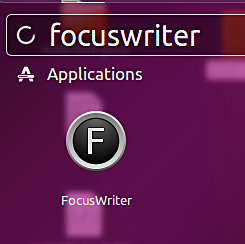 Using Focuswriter 1.6.1.12 on lubuntu. A really nice app, which does almost everything I want it to do, and actually does do the one thing I'm really anxious for it to do, but is really shy about telling me how to do it! (c) nobody seems willing to actually describe the steps for turning this vital feature on!